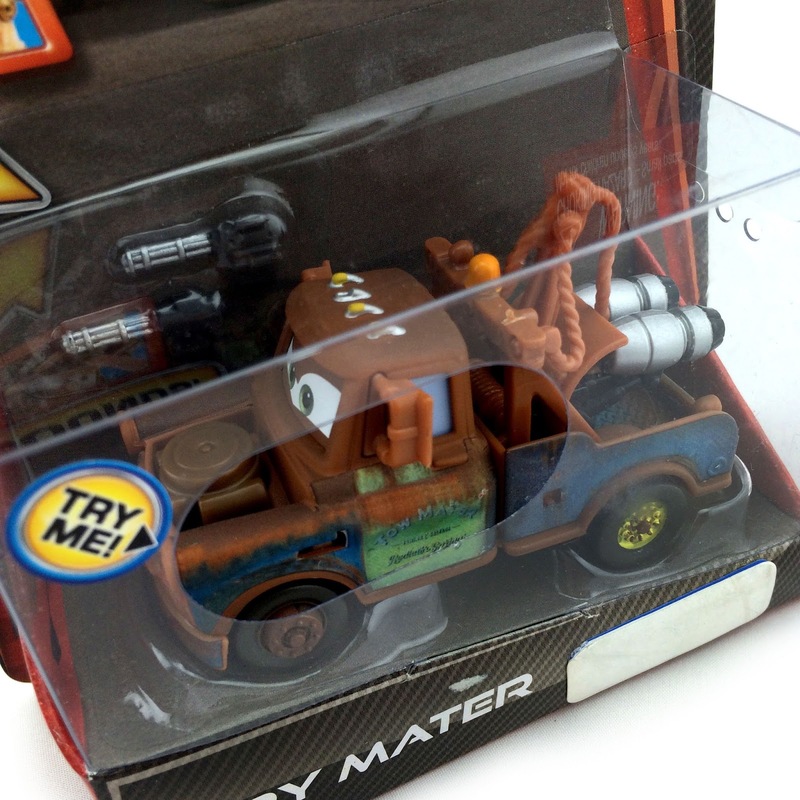 In 2011, as a part of the original Cars 2 line, Mattel released a sub-collection of 1:55 scale diecasts with lights and sounds...one of them being this here Spy Mater (part of the Walmart exclusive "Mater's Secret Mission" series)! 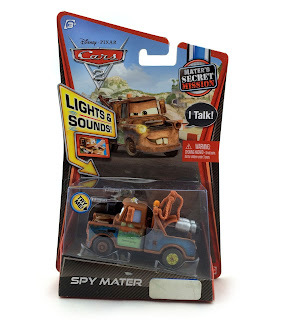 I didn't actually collect any of the lights and sounds cars back in the day (since I had all the characters as standard releases and getting them all again with sounds would have gotten a little redundant for me), but recently this Spy Mater one caught my eye. The reason? 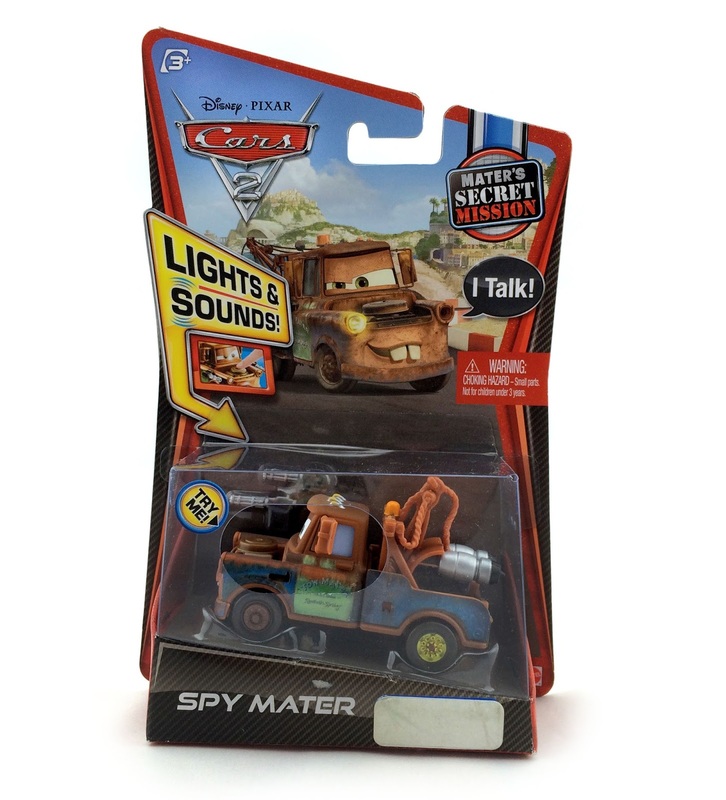 I realized that Mattel actually still hasn't made a standard diecast release of Mater with any spy gear/weapons! Since this one comes with his spy guns and his turbo boosters on the back, I figured at this point it was a must have. Plus, admittedly the lights and sounds are pretty cool. By pressing the button on the front of Mater, he'll say one of these eight phrases while his one working headlight emits flashing lights at 5-32 cycles per second. "I'm back fellow bad guys"
"And now...shoot! The second kind, not the first!" "What's goin on? Where are we?" "Wait wait! I didn't mean that kind of shoot!" I was lucky enough to find this one recently at a Mattel outlet store that we went to in California (on sale for just a few bucks), but you can also find it online such as on Amazon or eBay. As usual to my fellow Cars collectors...good luck on the hunt!